Chronic digestive complaints can be a sign of imbalance between bad (pathogenic) and good (probiotic) bacteria in the GI tract. 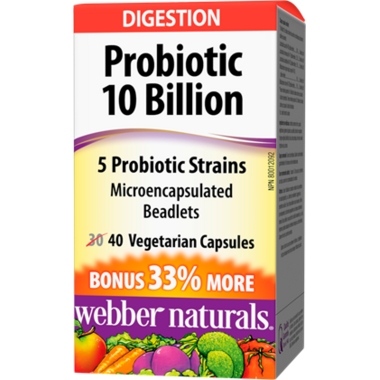 Complete Probiotic Double Strength, 10 billion active cells by webber naturals is a natural solution for chronic bowel problems, inflammation, allergies, and yeast infections. Microencapsulated – no refrigeration required. Potato starch, vegetarian capsule (carbohydrate gum, purified water), vegetable grade magnesium stearate (lubricant), silica, ascorbic acid. I have a digestive disorder and love this product, it helps immensely and it doesn't need refrigeration, so traveling isn't an issue. Like that I don't have to refrigerate. Seems to help when I remember to take.. Will purchase again. Having crohns disease this really helps me! Very good, like that it doesn't need to be refrigerated, I can keep with my other supplements and remember to take it. Felt it really made a difference in my digestive health. these are very good....tried many brands and so far I will buy these! Works great. I definitely feel a lot better after taking these. I just wish more came in a bottle. Very happy with this Probiotic. I will keep buy this brand. Not the most expensive and works well. I use this for general digestive health and to keep from getting sick. Seems to help.